The Festag Update brings a number of improvements, changes, fixes and balances to WARHAMMER II, along with a major skills update for the Lords and Legendary Lords of the Old World that appear in WARHAMMER II’s Mortal Empires campaign. Characters of the Old World now get red skill trees comparable to their New World counterparts in WARHAMMER II, plus numerous tweaks and changes to their existing skills, traits and abilities. Character mounts have also been standardised to unlock at specific ranks. These are all detailed below. 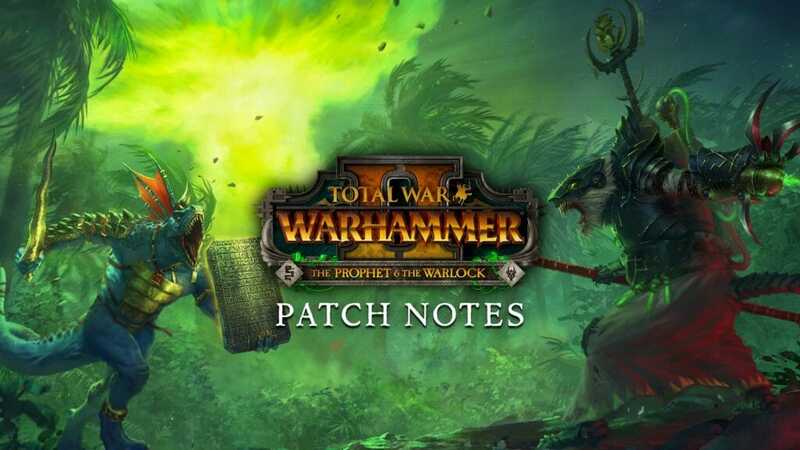 Alongside a fresh balance pass for specific battlefield units, the Festag Update also features some important bugfixes, including a fix for a crash that occurred when a Vampire Coast faction owning Pirate Coves was destroyed, and a fix that ensures Exhaustion occurs after a Hero has established a Pirate Cove. Spectator Mode has also been updated with new functionality. Please see below for full details. It is highly recommended that you start a new campaign unless you were opted into the beta. Since a large number of skills have been reworked, any points invested in skills prior to the Festag Update are likely to be lost in an existing save game. norsca_beta – This is for those who wish to remain on the most recent update prior to Vampire Coast release, as multiplayer save games from before Vampire Coast release will be incompatible when updated to Vampire Coast. coast_beta – This is for those who wish to remain on the most recent update prior to the Festag update, in order to continue with existing save games, which will not have any skill changes so existing Lord skills choices will be preserved. You should be automatically kicked from coast_beta. However if that is not the case, opt out of coast_beta to ensure you are on the latest build. Please note these are general Rank standardisations. Certain characters may deviate from the standard for balance purposes. AI can now be added to the game. Spectator hosts can now invite players into their game using the invite button. Host spectator will now be able to use the spectator controls. Players now connected to spectator host can now see ready status of the host. To rectify an issue that was causing Black Arks to recruit/replace higher level Lords than could be recruited from a province, all buildings that previously increased the Lord recruit rank in a single province have now been rebalanced to apply the effect to all provinces. For example, the Dark Elf building Palace of Dread Knights no longer increase local Lord recruitment by 2 but increases Lord recruitment by 1 in all provinces; these effects are now intended to stack across multiple provinces. Fixed a crash that could occur when a Vampire Coast faction owning Pirate Coves was destroyed. Fixed a rare end turn crash. Fixed a crash that could occur when Beastmen Brayherds changed stances. Fixed a crash that occurred when a building was changed while a settlement panel was open. Fixed a crash that occur when loading back into the campaign map from Tyrion’s Sunfang quest battle. Fixed a crash that could occur when triggering the Chaos challenger spawn when playing as Norsca. Fixed a crash in multiplayer campaign that occurred when one player unlocked a Vampire bloodline when the other player was playing as a non-Vampire Count race. Fixed an exploit where clicking on a hidden Skaven Settlement would show movement range of any garrisoned army. Lokhir Fellheart can now complete the Final Battle Vortex victory objective (will require a new Campaign to take effect). Luthor Harkon no longer has +2 to pirate crew recruitment. Count Noctilus’ Lord of Dread trait is now applied to Rotting Promethean Gunnery Mobs. Count Noctilus’ -1 turn for Necrofex Colossus recruitment now applies when recruiting via Noctilus’s ship and global recruitment. Khazrak’s +3 recruit rank for Bestigors now correctly applies factionwide. Malagor’s diplomacy bonus with other Beastmen is now +30. Morghur’s -60% upkeep for Chaos Spawn now correctly applies. Morghur’s Shadowgave trait now gives +8 melee defence rather than melee attack. Orion’s 20% upkeep for cavalry now correctly applies. Fixed Alith Anar assassination missions generating targets further away from the player than intended. Fixed Alith Anar assassination missions resetting incorrectly under certain circumstances. Exhaustion now correctly applies when establishing a pirate cove with a hero. Fixed agent success chance becoming 100% when the actual chance fell below 0%. Vampire Coast lord skills that require unit rank 7 now apply their effects correctly. 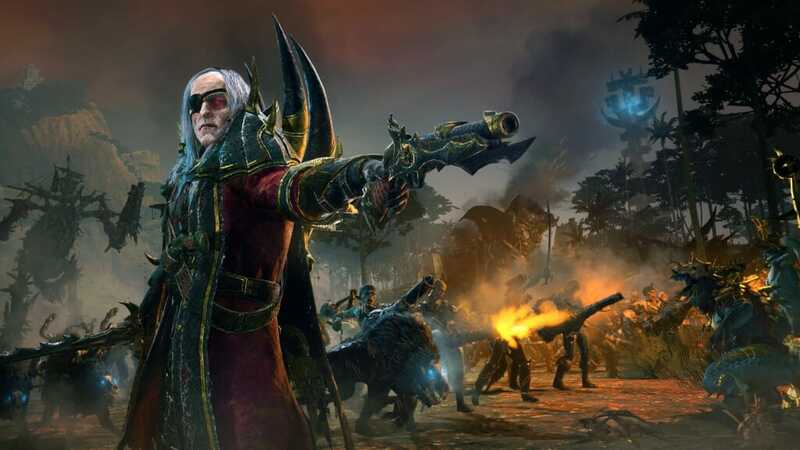 Vampire Coast army skills should now apply correctly to Regiments of Renown. Gunnery Wight’s Gunsight skill now increases missile damage rather than weapon strength. The Converted, Centuries and Command technologies for Vampire Counts now correctly apply their bonuses when recruiting via the Legendary Lord’s ships. The Converted technology now provides +5 tank for heroes recruited via a Legendary Lord’s ship. Old Grumblers, Warriors (Great Weapons) and Longbeards (Great Weapons) no longer have the one-handed technology effect apply to them. The following Greenskin technologies now also apply to Savage Orcs: Betta Arrer ‘Eads, Beasts of Burden, Black Orc Bellow, Betta Bowstrings, Massive Choppas. Wood Elves technology / Office effects that provide armour no longer state that it increases by a % but by a flat amount. Vampire Fleet Captain skill Kidnapping Assault Garrison action changed to Assault Units. Vampire Fleet Captains now have The Hunger ability. Restless Minions skill now also applies to the Khepra Guard Regiment of Renown. Bone Giants now gain buffs from Arrows of Asaph skill. Blood Dragon skill Ordo Draconis now correctly reduces Blood Knight recruitment time. Removed hidden duplicate skills for Von Carstein Bloodline Lords. Vampire Counts tech Serve in Life or in Death now correctly gives +15% income from Repression buildings. Lokhir Felheart will now be immortal if confederated. Wurrzag no longer has +30% upkeep for Savage Orcs after confederating with him. Black Arks will no longer lose their buildings upon defeat in battle. Sisters of Slaughter can now be recruited from Black Arks. Monstrosities of Morr no longer stacks accross multiple Lords resulting in Crypt Horrors being unrecruitable. Varghulf now only appears once in the ‘required to unlock units’ section. When Balefire building is damaged, it will now have half the Corruption effects as when it is not damaged (previously produced more Corruption when damaged). Capturing or sacking a region with the Third Book of Nagash will no longer spawn a sea storm in the region. A sandstorm should spawn as expected. Norscan technologies Blockading the Vampire Coast and Secrets of the Deep now use the correct icons. Fixed a Bloodkisses exploit that allowed rapid generation. Added Non-vampiric attrition immunity to Sylvanian Crossbowmen and Handgunner units. The following Beastmen factions (and their associated Brayherds) now have Chaos Wastes attrition immunity: Blooded Axe, Manblight, Ripper Horn, Shadowgor, Skrinderkin, and Stone horn. Fixed attrition immunity for certain attrition types when in stances. Reduced the public order penalty when capturing a settlement on easy difficulty. Fixed certain High Elf Mage Hero mounts not equipping in campaign. Prophetess now correctly gains her Royal Pegasus mount. Damsel Barded Warhorse skill has been removed. Red Duke now has the same mount in Battle and Campaign when using the Hellsteed and Barded Nightmare mounts. Removed links between any mount skills that had them. Fixed encounters at sea occasionally spawning Dark Elf armies containing Vampire Coast units. Fixed various instances where sea encounters could spawn on land or could not be attacked. Fixed an issue where treasure maps could point off the map. Fixed an issue with one of the treasure hunting puzzles having two solutions. Puzzles will now display correctly when playing in colour blind modes. Adjusted the Skaven and Dark Elf loyalty dilemmas to trigger less frequently. An event message is now received stating that the treasure hunt failed when lords and heroes are unsuccessful with their attempts to dig for treasure. The Amanar Rises event message shown after completing the campaign will now have the appropriate text displayed within the event message. Fixed a rare instance where event names could be renamed when changing resolution. Sartosa and The Awakening can no longer be upgraded to tier 5 when occupied by Wood Elves. Fixed an issue where the Vampire Fleet Captains provided in level 3 garrisons would not have their spells. All factions now have a garrison in Galleons Graveyard. Athel Loren now has a garrison when owned by Dark Elves or Tomb Kings. Skavenblight and Hellpit now have garrisons when owned by Bretonnia. Bloated Corpses should no longer grant kills without dying in the autoresolver. Fixed an issue whereby armies that spawned would sometimes not interact correctly with loyalty, certain effects and offices correctly. Beastmen and Chaos should no longer be able to occupy Albion. Galleon’s Graveyard can no longer be flooded or raided by Beastmen. Vampire Coast ships in encampment stance on sea will no longer show models that should be limited to encampment stance on land. Skin Wolf Werekin and Shaman Sorcerers will no longer show as Exalted Hero and Chaos Sorcerers in the Recruit Hero screen. Fixed several magic items not dropping after battle or dropping when they were not supposed to. Fixed the Scroll of Lykos magic item expiring and disappearing. The Red Duke now displays animations correctly on the campaign map. Cylostra Direfin’s porthole should now display correctly on all graphics settings. The objective arrow will no longer show as a yellow square when the diplomacy screen is open. Fixed Wood Elves not being able to trade with Tomb Kings & Vampire Coast after assigning the correct council seat. Added missing Walls building chain in Wurtbad for Greenskins. Added missing Troll Lair building in Karak Kadrin for Greenskins. Fixed duplicate Beast Lairz building for Greenskins in Karak Angazhar. Pirate’s Rest now correctly shows +1 Capacity for Gunnery Wights on the building information panel. The price of pirate cove buildings now displays correctly. Kemmler’s -50% upkeep for Necromancer heroes now works correctly. The Lahmian Bloodline -50% upkeep effect now correctly shows on the amount shown on the hero’s information panel. Various text and typo issued fixed. Music on campaign will trigger more responsively to campaign actions. Fixed a crash that could occur when a player tries to connect as a spectator to an ongoing battle and then trying to host a battle afterwards. Added Battle of the Eternal Tides map to Custom Battle. Cylostra Direfin’s Slaughterer of the Deep ability now works correctly. Female Vampire Fleet Admirals now have Skirmish. Female Dreadlord animations should now play correctly in the Mengil’s Manflayers rogue army. Fixed a large number of cases where deployment zones were the wrong way around. The buildings outside of the playable area in The Awakening siege map will no longer float. Improved total memory allocation use when using DX12. Capitalised the “I” in “Infamy” in the Race Attributes section for all Vampire Coast factions on the Lord selection screen, making them literally playable again. Added port icons next to mentions of port in the help text. The help text regarding how Lokhir Fellheart acquires Black Arks has been updated for clarity. Green Knight: Hit reactions ignore chance from 0 to 50, knock interrupts from 0 to 50, +20 ap melee damage, +10 base meleen damage. Pegasus Knights: increased mass from 700 to 1000, -100 cost. Grail Relique: Icon of Devotion-ability’s effect range changed from 40 to 55 meters. Thane: now has access to Rune of Slowness in multiplayer. Master Engineer: no longer has access to Rune of Slowness in multiplayer. Flagellants: increased Strength of the Penitent-ability’s physical resistance effect from +12% to +15%. Krimson Killerz: +20 men on Ultra, +150 cost, -5 armour, -1 health per entity, -1 charge bonus, -2 ap melee damage, +0.6 melee attack interval, tweaks to splash attack characteristics. 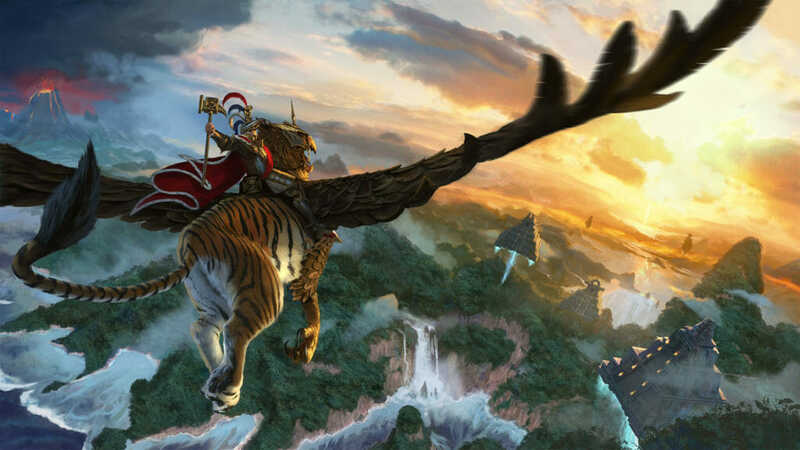 Alastair the White Lion – Dragon mounts: added siege attacker. Bastilodon (Solar Engine): slightly improved accuracy of projectile. Marauder Ice Wolf Chariots: can now run at 95 speed. Marauder Champions (Great Weapons): +4 health per entity, +2 run speed. Stormvermin (Halberds): +2 melee defence. Tomb Scorpion: Hit reactions ignore chance from 0 to 40, knock interrupts from 0 to 40, mass from 3000 to 2400, -2 melee defence, -5 melee attack, +5 bonus vs infantry. added Siege Attacker. Deck Droppers (all): -10 flying speed, reduced turn speed. Deck Droppers (Handguns): -2 ammo, slightly reduced accuracy, -2 ap projectile damage, -1 base projectile damage. Zombie Gunnery Mob (Bombers): +5 charge bonus, +2 ammo, +4 melee attack, +40 number of men (on ultra), -2 health per entity. Zombie Gunnery Mob (Handcannons): +50 cost, +40 number of men (on ultra), -8 base projectile damage, +7 ap projectile damage, -2 health per entity. Gallows Giant: projectiles no longer expire before reaching max range. Death Shriek Terrorgheist: +0.5 entity height, entity is now 57% wider, so a bigger target and harder to pull out from melee. Luthor Harkon – Death Shriek Terrorgheist: now uses the same entity size as the regular Death Shriek Terrorgheist (previously used a dragon-sized entity). Luthor Harkon (all): removed All Hands Hoay!-ability In multiplayer battles. -100 cost. Vampire Fleet Admirals (all): removed Hornswaggle-ability in multiplayer battles. Cylostra Direfin – Rotting Leviathan: Added Siege Attacker. Terrorgheist: +0.5 entity height, entity is now 57% wider, so a bigger target and harder to pull out from melee. Blood Dragon Vampire Lord (all): removed Undeath Resurgent-ability in multiplayer battles. Blood Dragon Vampire Lord – Barded Nightmare: -10 armour, +100 cost. Red Duke – foot: +100 cost, added Frenzy-ability. Red Duke – Barded Nightmare: +100 cost, added Frenzy-ability. Red Duke – Hellsteed: +10 armour, +100 cost, added Frenzy-ability. Red Duke – Zombie Dragon: -4 melee defence, +100 cost, added Frenzy-ability. Lahmian Vampire Lord – Zombie Dragon: added siege attacker. Necrarch Vampire Lord – Zombie Dragon: added siege attacker. Von Carstein Vampire Lord – Zombie Dragon: added siege attacker. Treeman: Hit reactions ignore chance from 0 to 70, knock interrupts from 0 to 70. Helm of Discord: -10m effect range. Red Ruin (Ungrim): changed to unlimited uses, duration from 50 to 35 seconds, +9 cost in multiplayer, added recharge in melee condition. Axe of Dargo (Ungrim): -16 ability duration, -90 ability recharge, added recharge in melee condition. Rune of Slowness: changed to -18% movement speed, removed charge bonus effect. Rune Helm of Zhufbar: -4 leadership, removed deactivation condition. Get on Wiv’ It (Azhag): removed charge bonus effect, added +8 leadership effect instead. Gitsnik (Grimgor): -18 ability duration, -90 ability recharge, added recharge in melee condition. Captain Roth’s Moondial: -50m target range. Horn of the Wild Hunt (Orion): +3 duration, removed speed effect, +36% charge bonus changed to +54% charge bonus. Denizens of the Deep: +4 seconds recharge time. Drowned Dead: +1 power cost. Invocation of Nehek: -1 seconds duration. Invocation of Nehek Upgraded: -1 seconds duration.